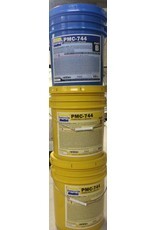 PMC®-744 has been used for years by mold making professionals to cast plaster, concrete, resins, etc. It is excellent for making molds that are strong, durable and dimensionally stable. Low viscosity ensures fine detail reproduction. PMC®-744 is ideal for making ceramic case molds and plaster block molds, reproducing ornamental plaster, making molds for casting concrete, casting a variety of Smooth-On urethane resins, casting wax and making a variety of mechanical rubber parts.